The weather outside is cold, dark, raining and pretty much chills you to the bone when it comes down to it and in all honesty that is the perfect setting on the 20th Anniversary of King Diamond’s concept album “The Graveyard”. This would be the first ever album by the King on the Massacre Records label and since I’ve already reviewed its remastered edition back when that came out in 2009, I will defer you to my thoughts on THIS LINK. Please check that out along with the Official Album Wiki entry at the close of these thoughts. I remembered liking it, but for me the best King Diamond stuff was his earliest efforts and I guess I feel that way since that was the music that found me getting interested in his brand of Macabre Metal in the first place. Take a few moments to review the tracks down below so you can recall your favorites if you had any on the album. The 2014 return to full touring activity by the great King Diamond has found not only scores of his appearances breaking venue records in attendance but also a growing number of new fans to his musical body of work. In 1995 he offered up his first album on Metal Blade Records with “The Spider’s Lullabye” and this would not be a full concept album as he was known for doing in the past. The recording was remastered and re-released back in 2009 and was discussed on this website along with its companion re-issues. 2015 finds this recording being re-issued anew with a few bonus demo tracks and since my thoughts on the main body of work remain the same I am refreshing reader memory below. I’ll be back to discuss the bonus tracks afterward. Let’s continue. 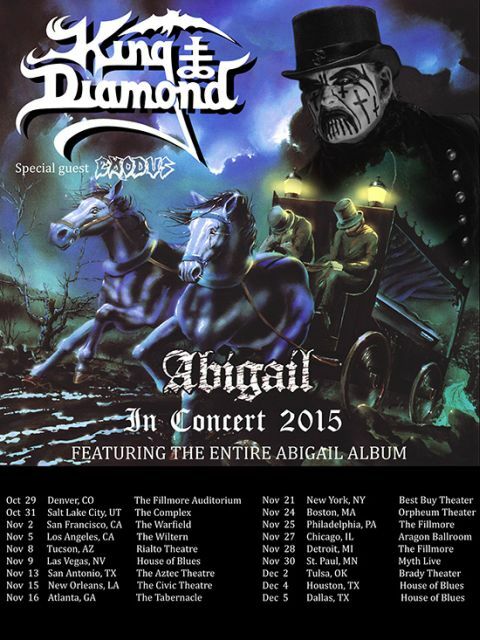 King Diamond returns and is bringing us into the world of his album “Abigail”, this masterpiece of Metal horror storytelling will have the fans thrilled and chilled to the bones. Dare you miss his invitation? That would surely not be wise. Support for this tour comes from Exodus. All tickets purchased under the Best Buy Theater naming will be honored at this performance.